Having just shelled out $60 for a one-time pass that allowed me to sit in the United Club for a couple hours (shameful, I know), it felt really good to strut over to the American Airlines Admirals Club here in terminal 2, flash my City Executive Card, and walk in like a boss. Ok, well, at least it felt like that for only a brief moment. Domestic airline lounges aren’t usually any more extravagant these days compared to any random quiet spot you could find outside in the main terminal, and the only real perks travelers get at these clubs are a basic assortment of free finger foods and slightly softer seating options. 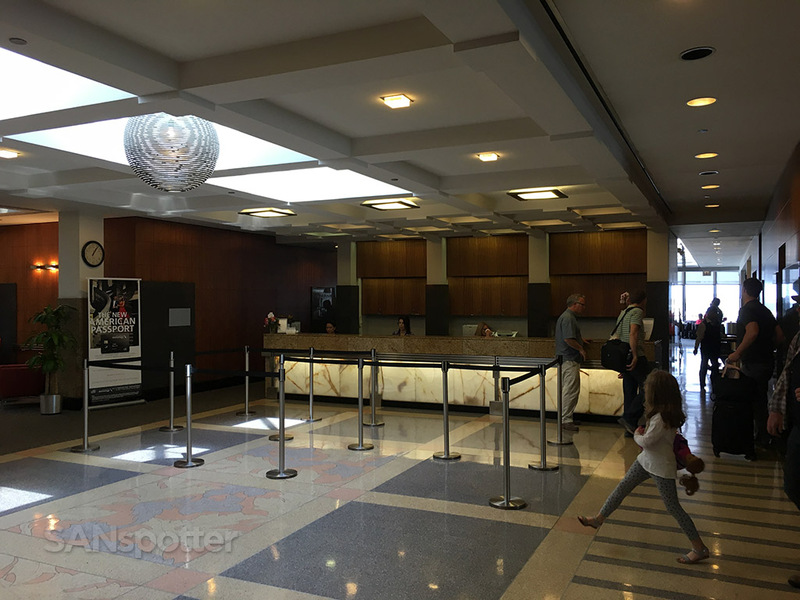 There’s also no guarantee that the lounge will offer a more quiet and relaxed environment than what you can find outside – so think twice before you pay out of pocket to access a day pass for one of these lounges. 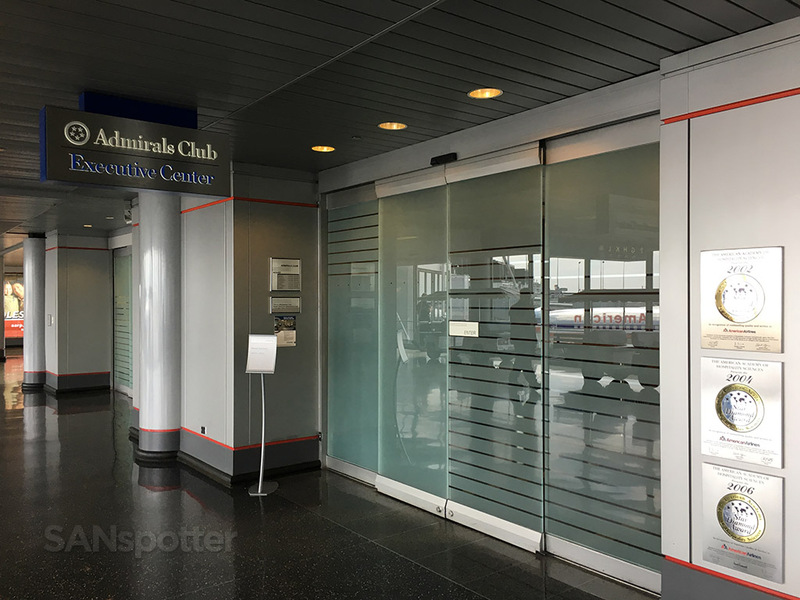 Located right in the heart of terminal 2, I’ve walked past the entrance to this particular Admirals Club a million times (give or take) over my years flying in and out of ORD. I’ve never once stepped inside before today, and I really didn’t know what to expect before going in. 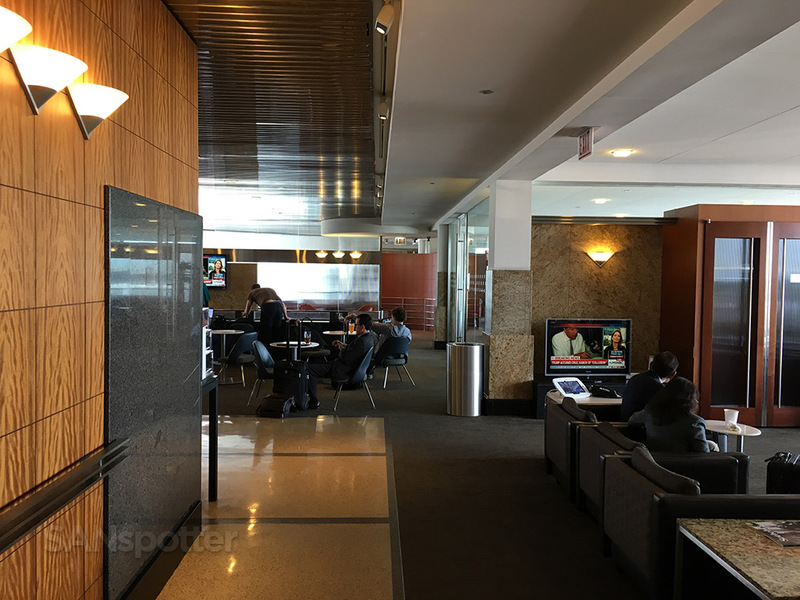 I assumed that it would be a very large lounge due to the fact that American Airlines has a pretty substantial operation here and this is the only Admirals club on premises. And the “Executive Center” signage on the outside made it feel especially more important, even though I didn’t even know what that really meant. 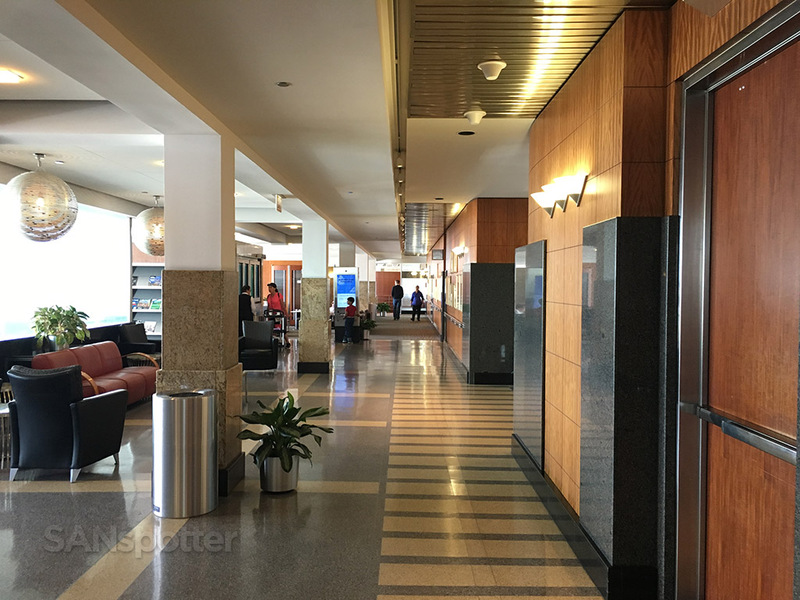 The “Executive Center” label became more apparent as I made my way past the front entrance and found myself at the elevators which would take me up two flights to the main lounge. 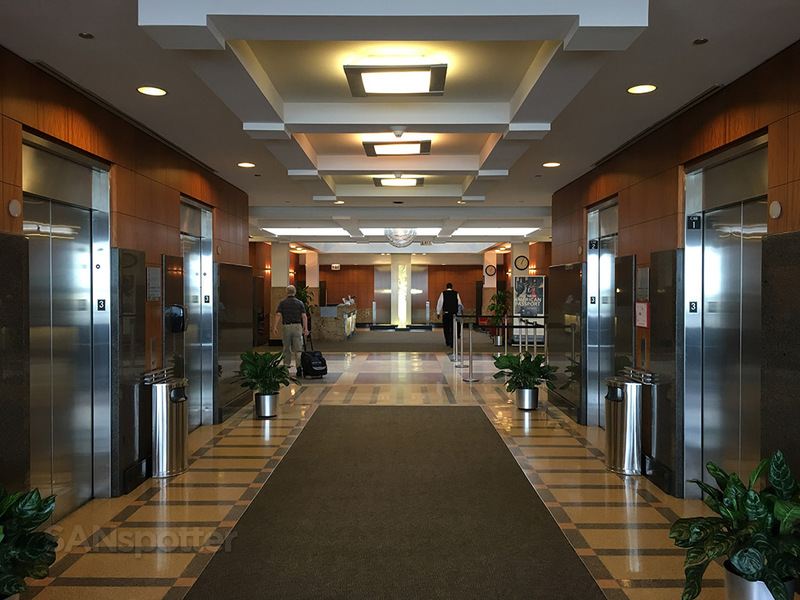 The Executive Center was on the second floor, which led me to assume was just conference rooms and meeting spaces. 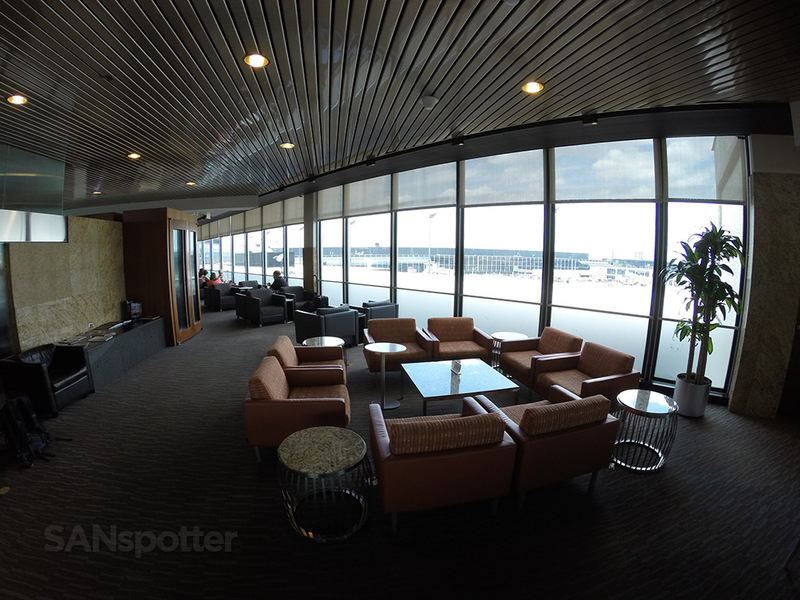 I didn’t feel like pushing my luck and getting thrown out of someplace I wasn’t allowed to be, so I just focused my attention on the Admirals Club on the third floor today. You can bet I’m gonna check out that second floor if I ever fly though here wearing something a bit nicer than my ratty jeans and and trusty North Face backpack! 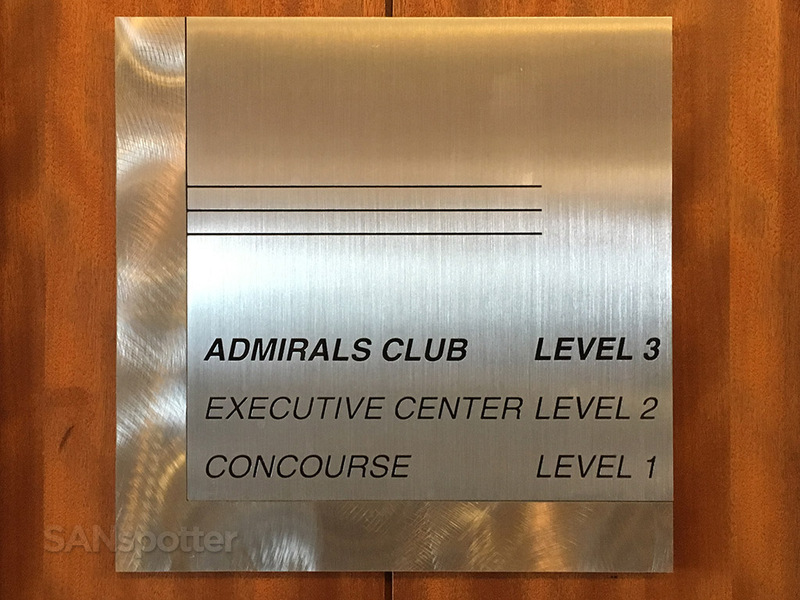 The Admirals Club is on level 3. Right away I was impressed with the layout of this club. 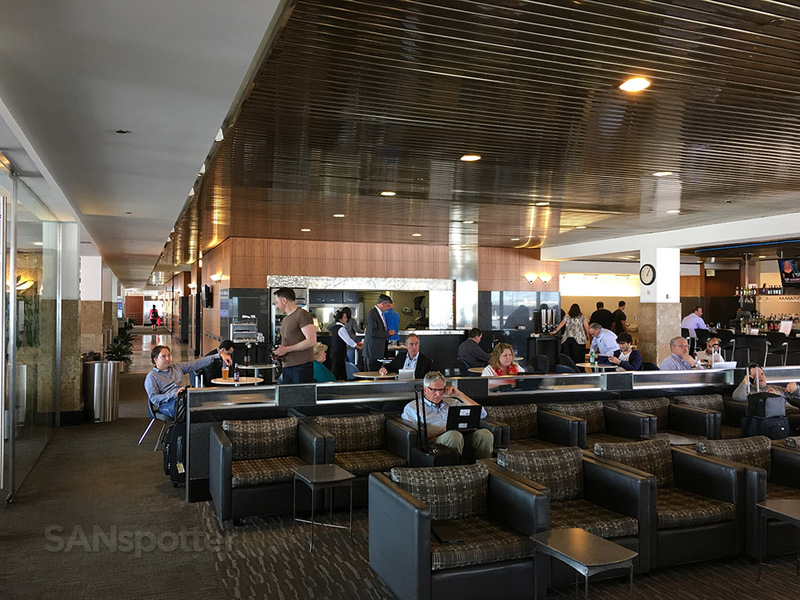 I guess I was expecting one large open room like the United Club I just came from, but this one was much larger and broken up into a myriad of smaller rooms with lots of little nooks and crannies. In my opinion, that’s the way an airline lounge should be. Large open spaces don’t feel as comfortable and cozy as a multi-room layout with a large variety of seating options. First thing I noticed after getting off the elevators was how nice the finishes were – I’m a sucker for copious amounts of metal and wood! The customer service desk, located adjacent to the elevators. 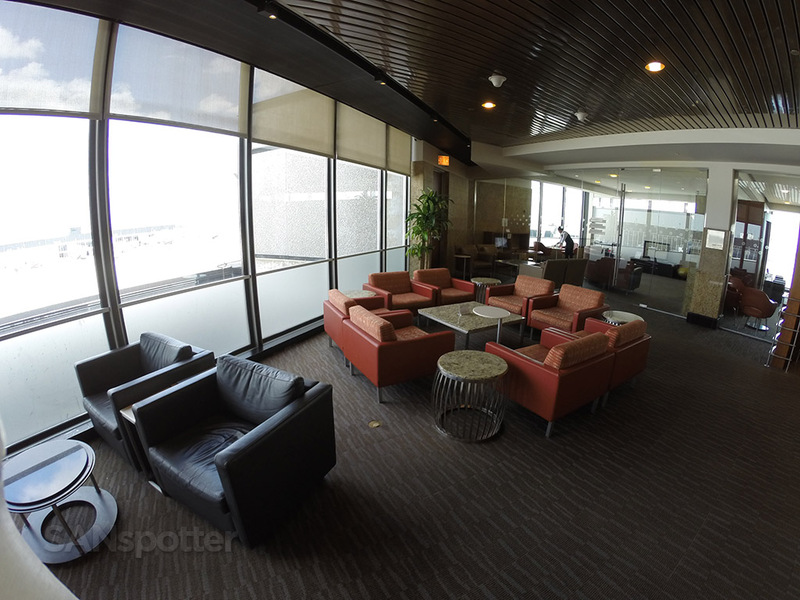 This is a large lounge with many different types of seating options. I found several of the seating areas to be quite dense though – can you imagine how uncomfortable it would be in here if every seat was taken? 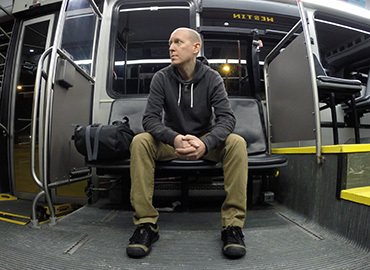 Luckily, the lounge is broken up into many sections with more comfortable seating arrangements. 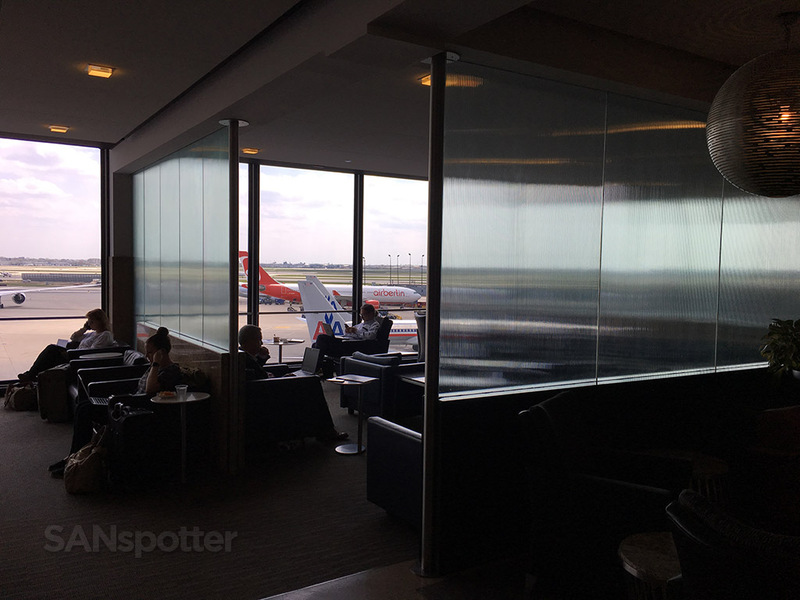 Translucent walls and section dividers kept the noise levels down. 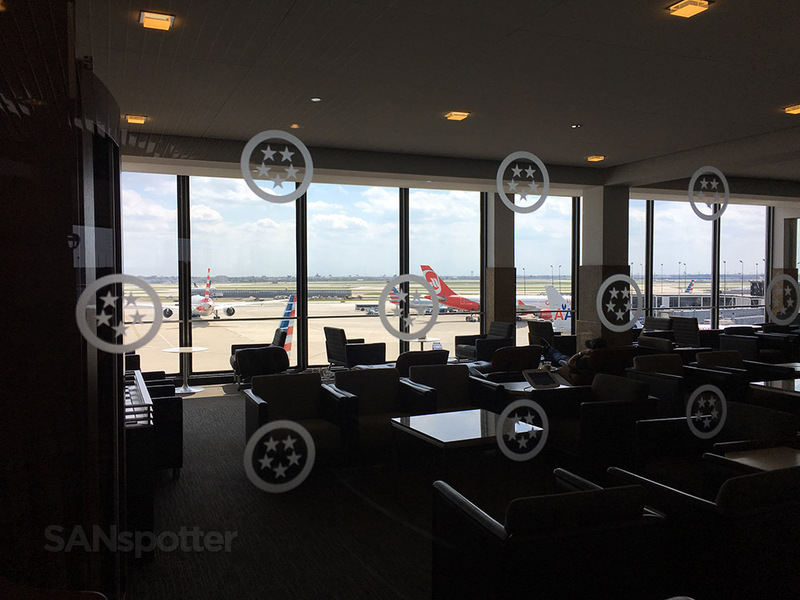 Just in case you forget where you are, there are friendly Admirals Club logos all over the place to remind you! 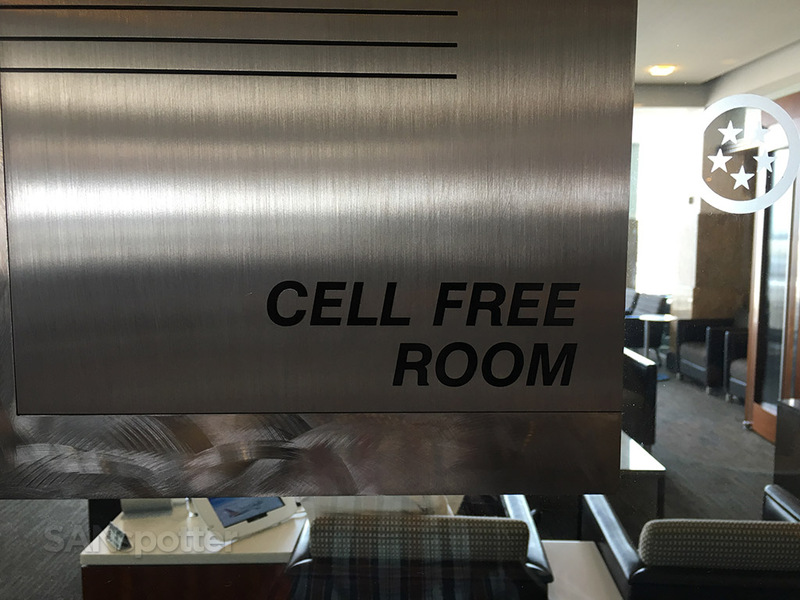 Some of the rooms had specific designations – such as this “Cell Free Room”. 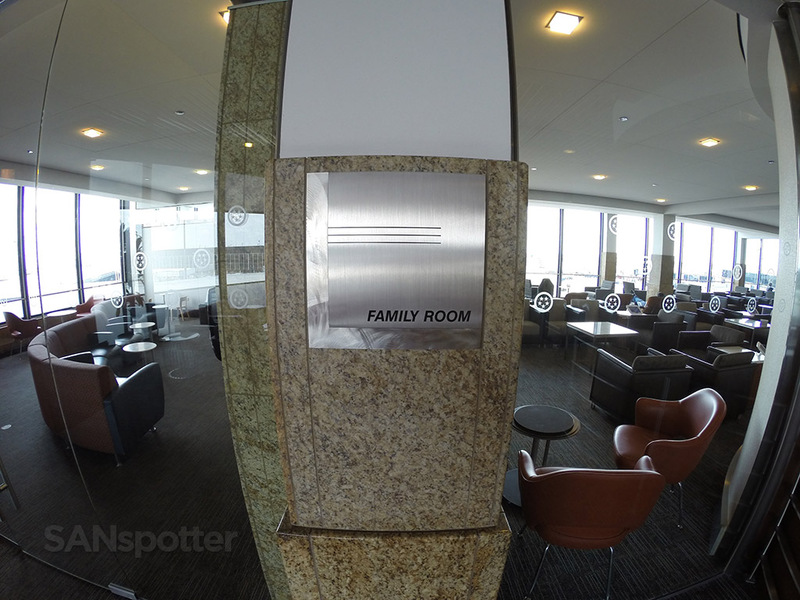 This “Family Room” was also nice to see, though it didn’t look so busy today. Large hallways and transitions between sections gives you a sense of how large this lounge really is. Here’s a look the other direction. Wide angle view of that same spot just to show the space better. 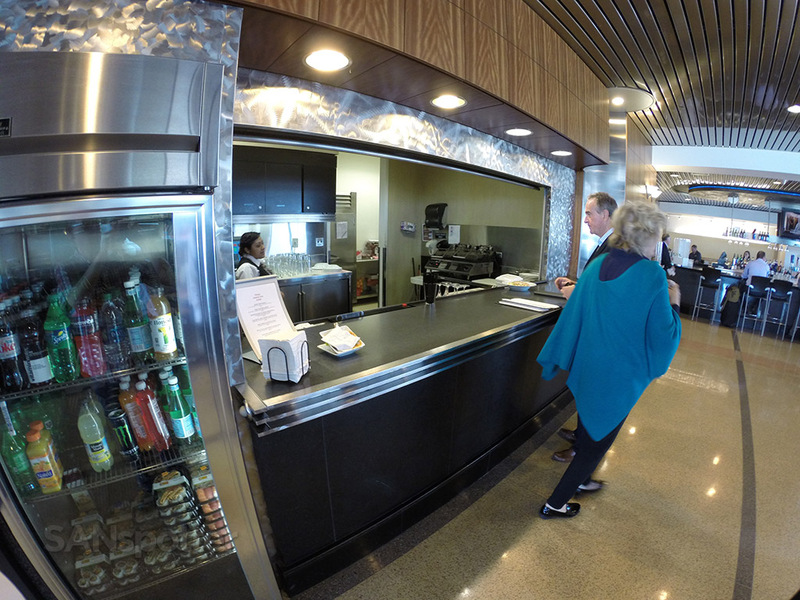 Also much appreciated was the fact that instead of one centrally located self-service food bar, there were actually several located throughout the entire lounge. 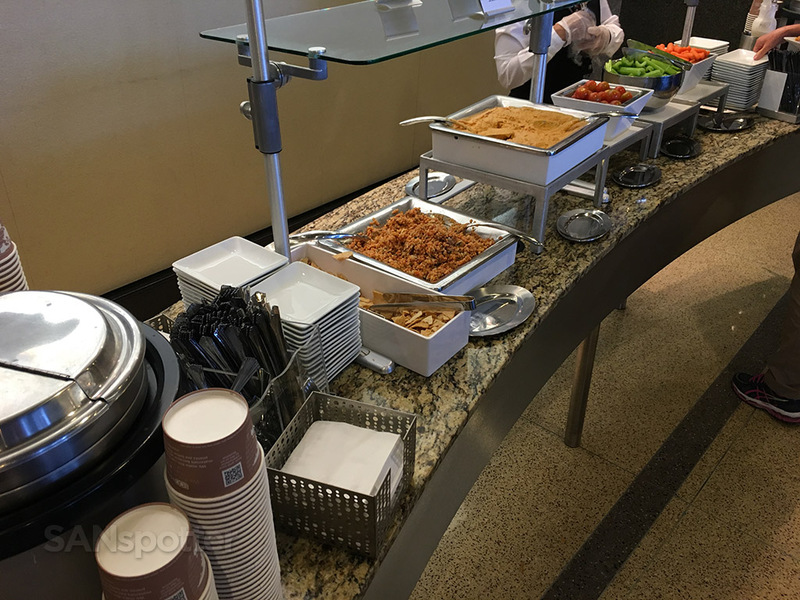 Each one offered basically the same kinds of food, but it was nice not having everyone in the lounge hovering over a single food station. One of several self-serve snack stations in this lounge. The snacks were basically the same from counter to counter, but there were some minor differences. This one had some pretty good pita chips and hummus. 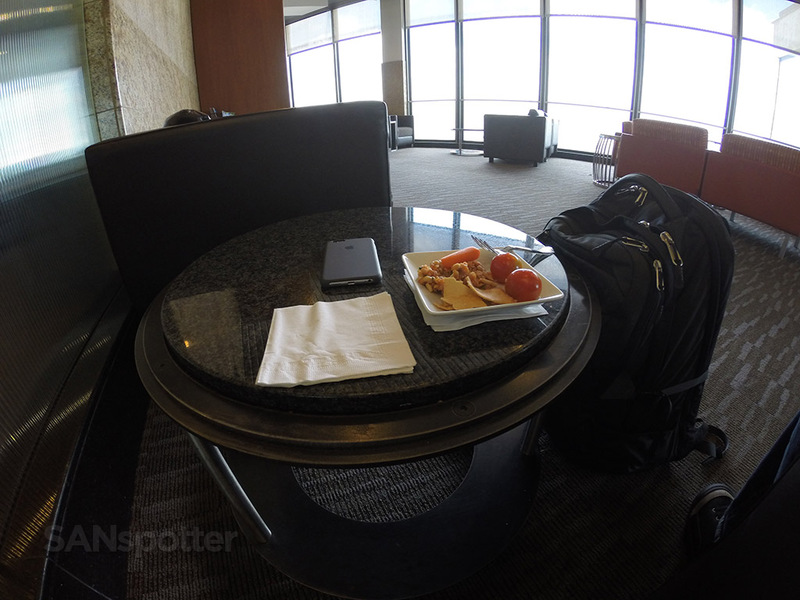 The first plate of three I had while in this lounge today. 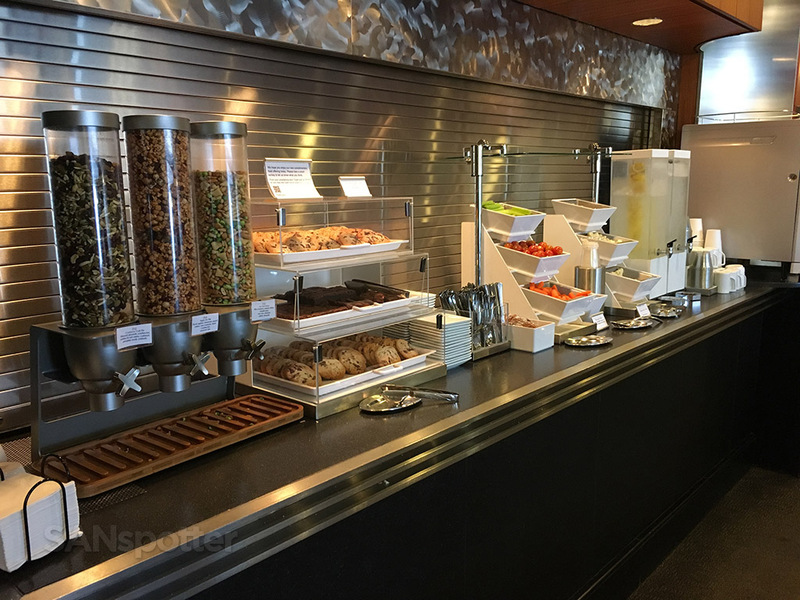 The finger food here was comparable to what I had just found in the United Club over in concourse B, but this Admirals Club took it one step further with a walk-up food-for-purchase station that looked somewhat decent. I didn’t try any food from here as all I needed was just a light snack to hold me over until my Global First 747-400 flight SFO I was scheduled to board a few hours later. There was sure to be food served on that flight, so I wanted to be at least halfway hungry for it. 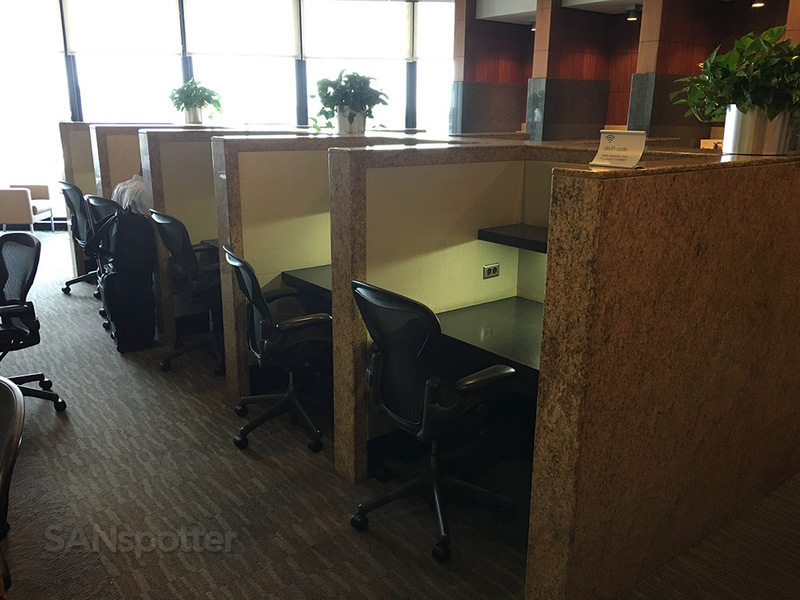 Every Admirals Club I’ve ever been in has had a pretty good section for getting work done. This one was no exception. 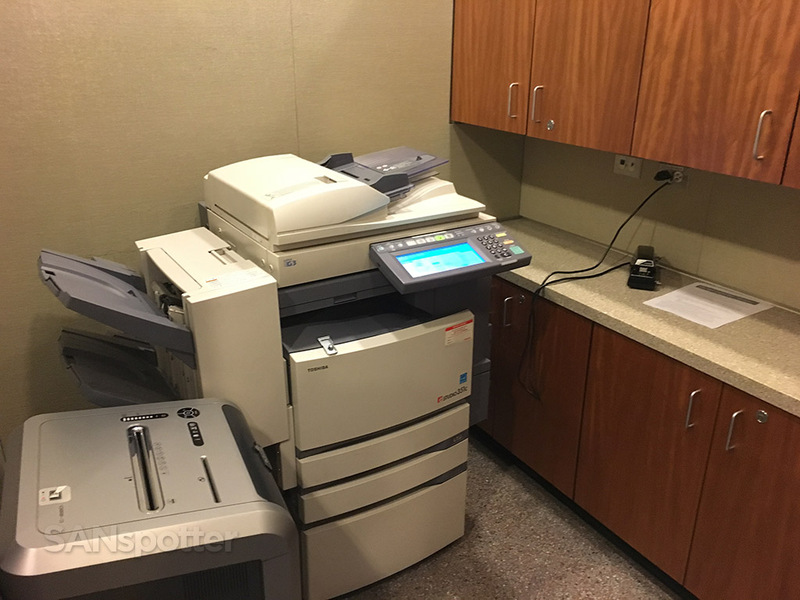 Copy and fax machines at your service. 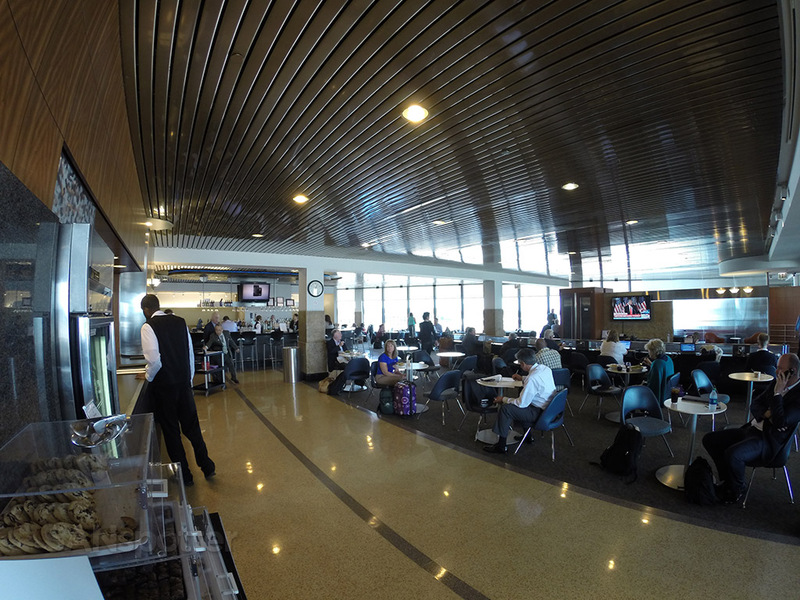 Wide angle view of the main section – that’s the bar in the back. View of the same section (from another angle). 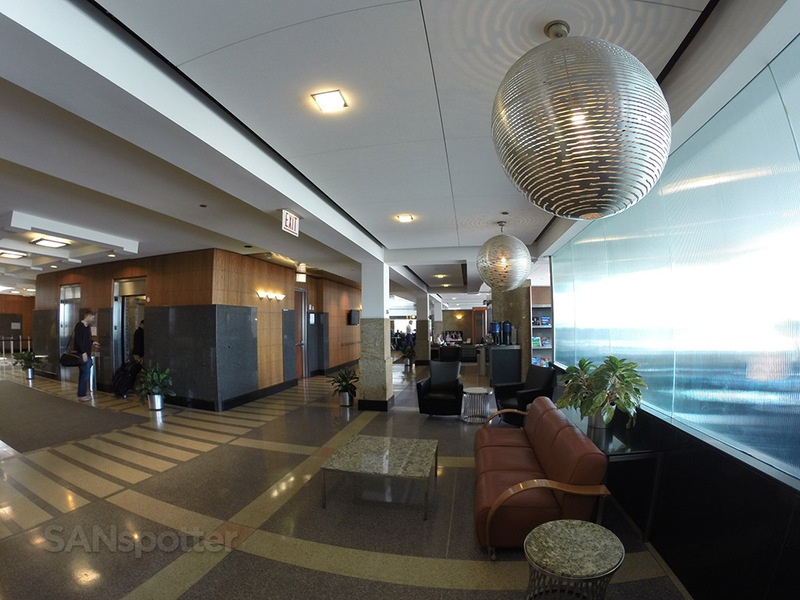 This is definitely one of the most decorated Admirals Clubs I’ve ever been in. Despite how large and busy this lounge is, finding a quiet corner to sit and relax was not difficult. 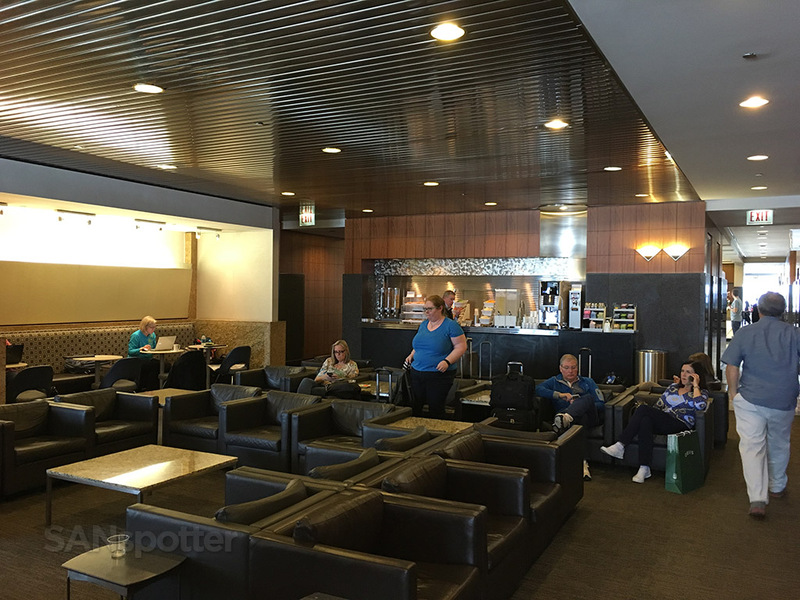 Having experienced other Admirals Clubs at San Diego and San Francisco, my final thought about this one here at O’Hare was that there’s very little consistency across the brand. 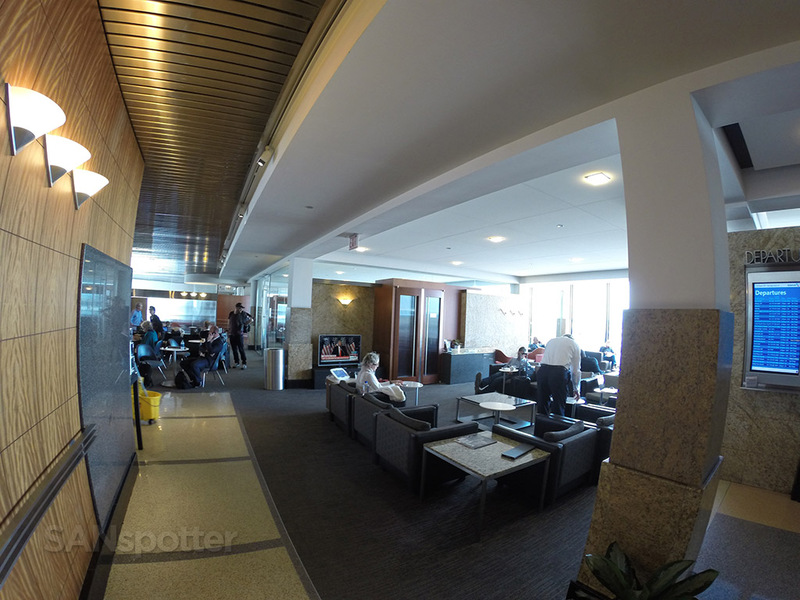 So far I’ve found Delta SkyClubs to be the most consistent from location to location, but to me, American Airlines seems not so concerned about their lounge experience. 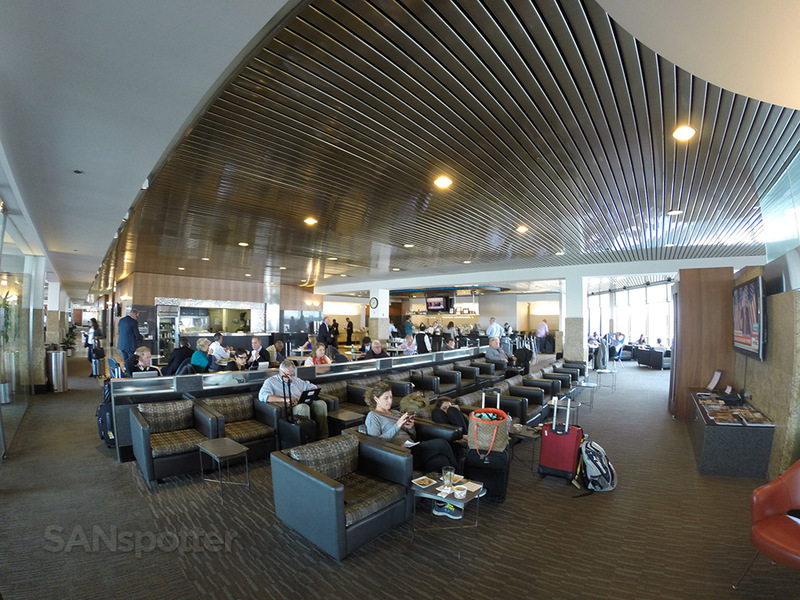 That’s not necessarily a bad thing – every Admirals Club I’ve visited so far has been quite nice, so at least I can feel confident I’ll have a comfortable stay no matter which one I visit. 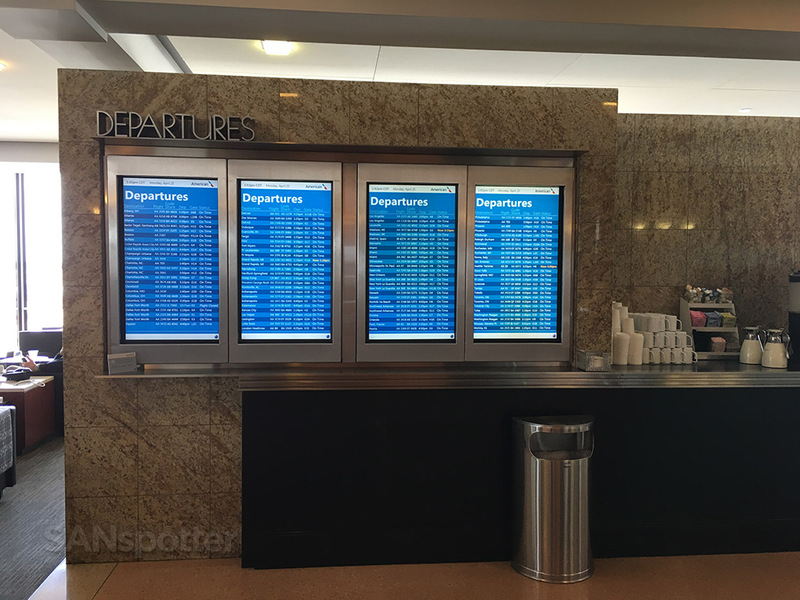 There’s another Admirals Club at ORD? Dang it, I didn’t know that! Oh well, I’ll be sure to check it out on my next trip through O’Hare.